You’d think people in the Bible didn’t need it so much because they had, well, GOD. 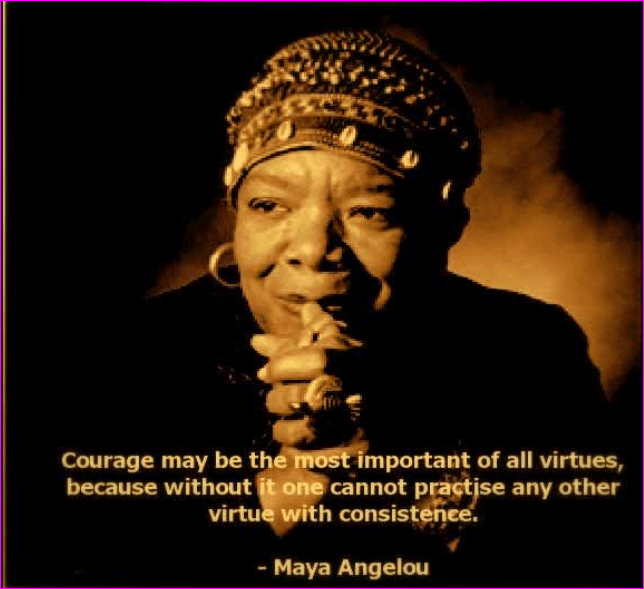 Yet there is enough uncertainty where the spiritual intersects our temporal, everyday world that 1) we still need faith; and 2) we still need courage. There’s that interesting story about Peter getting out of the boat to walk to Jesus out on the water. “Then Peter got down out of the boat, walked on the water and came toward Jesus. But when he saw the wind, he was afraid and, beginning to sink, cried out, “Lord, save me!” (John 14:29-30) Even with Jesus right there, and doing something no other man had ever done, Peter got distracted and got scared. He needed courage. The Bible often uses the term as a means of encouragement before undertaking a daunting task. Moses exhorted Joshua and the children of Israel to “be strong and courageous” in Deuteronomy 31:6-7; David found “the courage to pray this prayer” and ask God about building the temple in 2 Samuel 7:27; and Hezekiah exhorted his leaders to “be strong and courageous” in the face of an Assyrian invasion in 2 Chronicles 32:7. The Spirit of the Lord encouraged Paul to “Take courage!” in Acts 23:11 before he was called to testify in Rome. In each case, people had a right to be afraid—they were faced with uncertainty, danger, or impossible odds. Ambrose Redmoon (a beatnik and flower child back in the 60’s) said, “Courage is not the absence of fear, but rather the judgment that something else is more important than fear.” There are things in your life that you fear; what is more important to you than fear? I suppose that if I lived a life of true faith, and if I had real confidence in God, I would never be afraid. I’d be like Daniel in the lion’s den, or Shadrach in the fiery furnace, or Paul about to face shipwreck on a stormy sea. But like everybody, I am often distracted by the cares of the day, or the uncertainty of the future. Is it wrong to be fearful? Consider this: when I allow fear or worry to dominate my thoughts, I am actually practicing a little form of idolatry, because I am allowing something in my heart and mind to be bigger than God. I may not intend to, but the reality is I am inadvertently replacing God with my own concerns. What can I do about that? In Psalm 31, David said we should take courage. It’s interesting to note that in this Psalm, David talked about traps, affliction, deceit, troubles, sorrow, grief, and tribulation… He had firsthand knowledge of being besieged by circumstances and abandoned by friends. He speaks of lying enemies, conspiring schemers, and describes himself as a broken vessel. Because of all he had experienced, his closing statement about taking courage is not rose-colored optimism, it is a hard-fought insight about how faith in God can instill hope and confidence into believers even when many things turn against us. Blessing and hope are not found in the absence of trouble, but in their midst. Be strong today, and let your heart take courage! And there are times you have to deal with worry and adversity. To enemies, affliction, sorrow, grief, and outright danger. His courage is available to us. Look up, and take it.